There are many ways to tune an electric guitar. The easiest way is with a guitar tuner, if the intonation is set properly. Tuning a guitar trains your ear to the different sounds of each note. Find a tuner that works with an electric guitar. 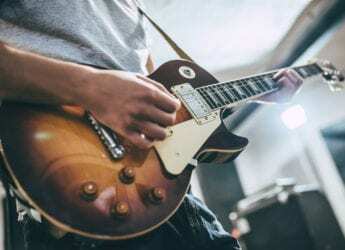 Learn to tune your guitar with one note off a fixed source, or by ear. This will help train the ear for the pitch of each note and help with finger placement and the pressure to be applied to the string. Be aware that when you tighten a string to tune it it’s put under lots of tension. Normally, this is not a problem. However, if your guitar has rough parts that can snag a string. If you tune it incorrectly and over tighten the string, it will break. Since the string is under so much tension, it can cause a lot of damage. Don’t over tighten strings. If in doubt, tune down. You need to do one string at a time. Strings have tension and a pulling effect on the guitar’s neck. The force that each string exerts on the neck causes it to bend slightly. 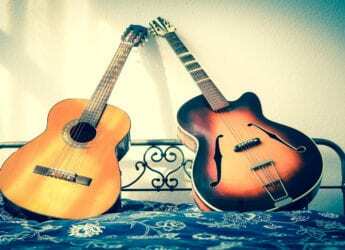 Once you have tuned your guitar, you will probably find that some strings have gone out of tune. You will need to repeat the above procedure until all the strings are in tune. 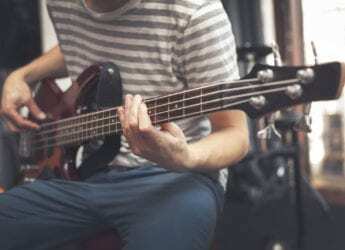 Good intonation means your guitar will stay in tune as you play different notes along the neck. The string may be perfectly in tune but, on the 10th fret, it might be ½ semitone out. This is bad intonation. Bad intonation can be caused by a mismatch between the length of the string and the spacing of the frets. It can also be caused by a non-uniform string (that is, the thickness changes along the length). If you can’t fix the intonation, try changing your strings. Intonation is easily adjusted on the electric guitar since the bridge consists of several adjustable parts. A flat note means the string is too long, whereas a sharp note means the string is too short. Adjust the string slightly by moving the appropriate bridge piece. You may have to repeat this several times on each string. It is time-consuming the first time you do it, but well worth your while.